French Emblems: Emblem: Jamais ne vit le Tyran sans terreur. 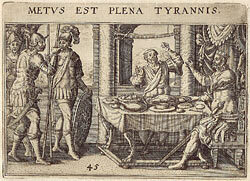 METUS EST PLENA TYRANNIS. Jamais ne vit le Tyran sans terreur. Par un foible filet, fit son glaive suspendre. En longue suitte d’ans son regne peut estendre. 1. In this context (and in the last two lines of the verse), Boissard is probably referring to King Henri IV of France, who in 1593 was coming closer to his goal of laying down arms and ruling a kingdom at peace, and submitting to the rule of a righteous God (though Henri was soon to convert to Catholicism in order to do so, certainly not to the approval of the Protestant Boissard).